Officials from the U.S. spoke with members of the North Korean delegation on Saturday at the Association of Southeast Asian Nations (ASEAN) conference in Indonesia, and delivered a letter from President Trump to Kim Jong-un, the Washington Post reports. The big picture: It's unclear what the letter said, or what progress has been made towards denuclearization since President Trump and North Korean leader Kim Jong-un's summit earlier this year. Secretary of State Mike Pompeo said on Friday there's still "a ways to go" before complete denuclearization, but North Korean officials criticized the U.S. the next day for continuing sanctions despite their commitment to denuclearize. Pompeo warned the international community on Saturday against violating the sanctions against North Korea: "I want to remind every nation that has supported these resolutions that this is a serious issue...Any violation that detracts from the world’s goal of finally fully denuclearizing North Korea would be something that America would take very seriously." 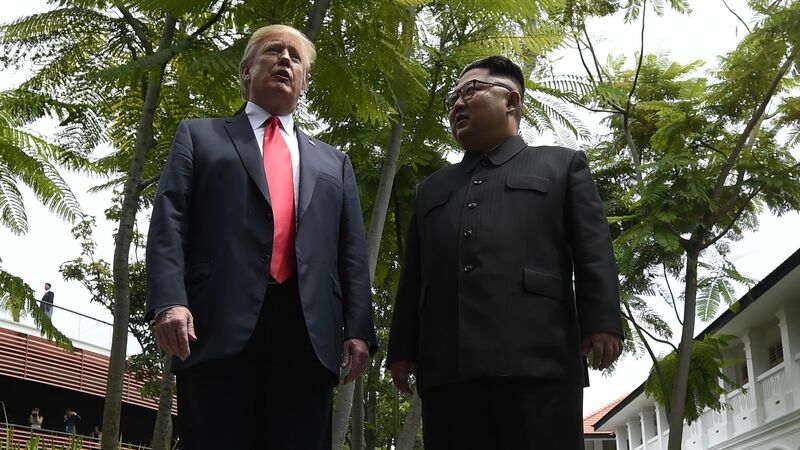 In response, North Korea Foreign Minister Ri Yong-ho said the regime remains committed to the commitment it made with the U.S. at the June summit, BBC reports. Ri added, but "[w]hat is alarming...is the insistent moves manifested within the U.S. to go back to the old, far from its leader's intention." Trump praised Kim this week for delivering on his promise to return remains of U.S. soldiers from the Korean War, saying he was "not at all surprised" by the "kind action." Yes, but: At the end of July, there were reports that the regime was developing new intercontinental ballistic missiles. A U.N. Security Council report said that North Korea hasn't stopped its nuclear and missile development programs. Trump has maintained that he is pleased with the way things are going with the regime, tweeting in July: "A Rocket has not been launched by North Korea in 9 months. Likewise, no Nuclear Tests. Japan is happy, all of Asia is happy. But the Fake News is saying, without ever asking me (always anonymous sources), that I am angry because it is not going fast enough. Wrong, very happy!" Go deeper: North Korea's two paths back to "fire and fury"